We will be seeing a title change on the 25th. After last year's Scrooge-like schedule, WWE have decided to embrace the season of goodwill this time around by giving their roster - and presumably, a complaint-beset HR department - the whole holiday season off. We covered the Raw results yesterday (don't get too excited). Next week's happenings on SmackDown look a mite more interesting. The taping is set to begin with an eight-man tag pitting The Usos & The Club against The Bar & Sanity. The New Day - decked out, as you may expect, in boughs of holly - offer commentary as The Good Brothers pick up the win. An R-Truth and Carmella promo is up next, only to be gatecrashed by Daniel Bryan. The WWE champ lays into Truth for being a "tired, old joke", though he's having none of it, retorting that he's going to win the Royal Rumble. The segment, predictably, concludes with Bryan beating up Truth. Mustafa Ali then bests Andrade Almas in an apparently super match, before The Miz introduces Best in the World Shane McMahon. The pair announce they are now officially a tag team. Good Lord. The final portion of the show begins with Jeff Hardy losing to Samoa Joe via disqualification. An irate Joe chokes the younger Hardy brother out after the contest. Finally, Rusev overcomes Shinsuke Nakamura to claim his US title in the main event. 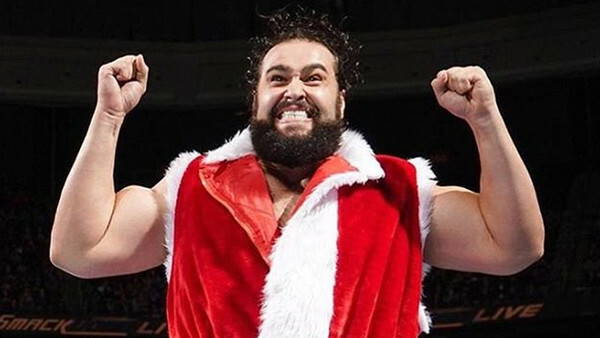 Merry Rusev Day to all!